When it comes to kitchen design, no other feature feels as modern as a waterfall countertop. Unlike traditional toppers, which are flat slabs that sit on top of base cabinets or an island, waterfall countertops flow over the sides to the floor creating a seamless appearance. While most types are made of luxurious materials like marble or quartz, budget-friendly versions, which are equally beautiful, include butcher block or stainless steel. To whet your appetite for this kitchen trend, behold our favorite examples. Mixing different color temperatures puts an inviting spin on this contemporary kitchen by Studio McGee. Blue cabinetry throws focus on the white quartz waterfall countertop. The wood features and brass accents warm up the mostly cooled toned space. There is a reason professional kitchens are decked out with stainless countertops. The material is practically indestructible and depending on where you live it can cost much less per square foot than both natural and engineered stone. In this cooking space by interior design firm LineBox Studios, a stainless steel waterfall countertop combined with matching appliances solidifies the kitchen's sleek modern appearance. The crowning jewel in this cooking space by Landis Construction is the walnut, butcher block waterfall countertop. It enhances the kitchen by providing more room to both cook and entertain at a fraction of the cost of natural or engineered stone. Wood also brings a natural richness and warmth that you do not get with marble or quartz. Here is a décor trick: Keeping the walls and upper cabinets white keep the cooking space from feeling dark or moody. The two must-have ingredients for any sleek modern kitchen are flat-front cabinetry and a quartz waterfall countertop as shown in this cooking space by Soda Pop Design. Dark features and interesting textures like the oven hood and backsplash keep the room from feeling sterile. The interior design firm, Linebox Studio made the kitchen the core of this open concept home. The cooking space was designed for entertaining allowing the home chef to work while interacting with six seated houseguests. The kitchen island features a concrete waterfall counter with built-in cutting boards, which quickly pop up for cleaning. Transitional kitchens, like this gorgeous example by Casey Sarkin Interior Design, meld traditional elements with modern features. The marble waterfall countertop beautifully frames the farmhouse-inspired oak kitchen island. 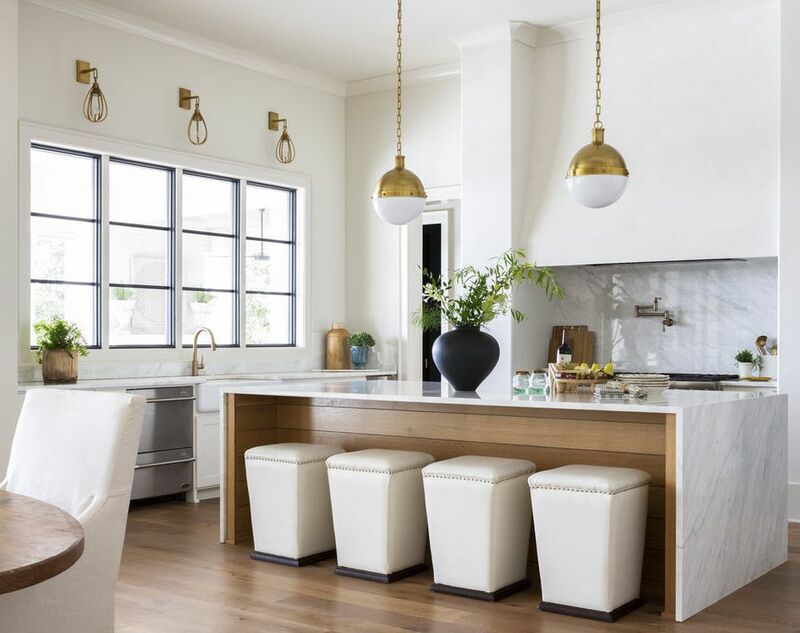 Classic gold fixtures from the lighting to faucet add visual warmth to the crisp, white cooking space. Sure, white kitchens will never go out of style. But if you crave bold hues and visual texture this gorgeous cooking space by Marc Houston Interior Design will satisfy your appetite. Outfitting the kitchen with colorful features is a surefire way to create a little visual separation from the main living area in the open concept home. We also appreciate how wood tones always pair beautifully with various shades of blue. Here cabinetry and a backsplash in watery hues are combined with a warm, wood waterfall kitchen island. Can't afford marble? In this kitchen by Jessica Leigh Interiors, a white granite waterfall countertop looks just a gorgeous as the more expensive stone. The gray kitchen cabinets and stone tile floor amplify the granite's lovely gray flecks and veins. Gorgeous glossy features are the highlights in the showstopping kitchen by Kate Coughlin Interiors. The marble waterfall countertop surrounds a stunning white lacquer island with beautiful bronze hardware. The striking veining shown on the counter and backsplash creates a dramatic effect that breaks up the white space. Here a quartz waterfall counter infuses elegant function into a transitional kitchen by Allison Elebash Interior Design. The robin's egg blue cabinetry picks up the flecks and veins shown in the engineered stone. Mixing metals is definitely a do. Here a stunning gold chandelier and sleek stainless steel fridge both enhance the modern vibe of the cooking space. A leathered granite waterfall countertop sits front and center in this kitchen by interior designer Suzann Kletzien. Its dark gray color lends contrast to the white and light gray kitchen. As shown in this white kitchen by Michelle Berwick Design, a waterfall countertop can turn a kitchen island or peninsula into a spectacular focal point. For instance, this three-inch-thick quartz example encases a stunning stained wood herringbone peninsula complete with a corner sink and a brass gooseneck styled faucet. Another reason to love this beautiful wood feature is that the black stain conceals dirt and scuff marks. Sticking to a monochromatic color scheme can instantly make any kitchen feel modern. In this cooking space by Soda Pop Design, various features in light gray, including a quartz waterfall countertop, set a chic tone. The leopard print counter stools break things up a bit with a pop of whimsical pattern. A waterfall countertop provides the ideal opportunity to show off the natural patterns of a stone slab. The black marble waterfall counter in this spectacular kitchen by interior designer David Dalton does just that. It was constructed from one humongous chunk of stone that was seamlessly cut for a dramatic effect. While the island is the main focal point, additional black accents including the oven hood and cabinetry draw the eyes around the cooking space. A crisp white cooking space creates the perfect clean slate for a home chef. Here Oxbow and Olin Design Studio installed a Calcutta quartz waterfall kitchen island. While the material looks just like marble, it is considered more durable, because it is nonporous, unlike natural stone which is prone to staining. Light gray accents shown throughout the kitchen such as the backsplash and swivel counter stools match the veins in the countertop while drawing the eyes around the room to make it feel bigger and airy.